At India Today South Conclave 2018, heated debate on electoral prospects of national parties and state powers leads to prophecy for 2019. 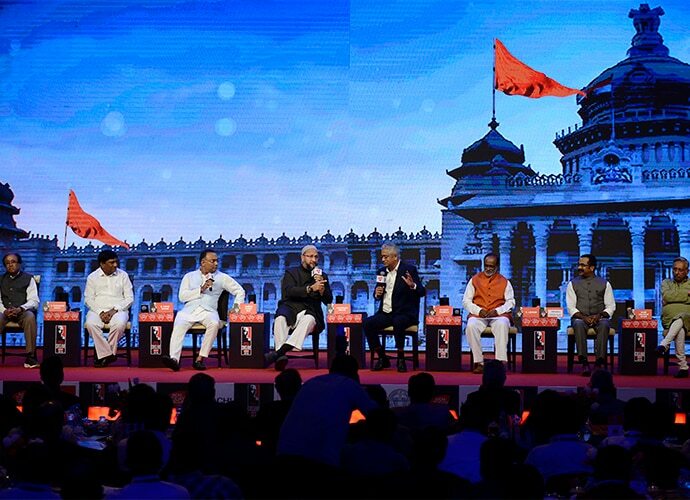 It was a spectacular show of verbal fireworks at the India Today South Conclave 2018, held in Hyderabad, with the session “Saffron in the South” being the jewel in the crown of stellar discussions. Moderated by senior journalist and India Today consulting editor Rajdeep Sardesai, the session was attended by a panoply of voracious leaders from many different parties, both the national and the regional heavyweights. While the Congress was represented by Karnataka PCC’s Dinesh Gundu Rao, as well as in an informal capacity by the suspended Mani Shankar Aiyar, the BJP faces included Krishna Saagar Rao and K Laxman, state president of Telangana BJP. CPI’s Sudhakar Reddy and TRS’ Vinod Kumar were also present, as was the firebrand AIMIM leader Asaduddin Owaisi. While a very frank Dinesh Gundu Rao called the BJP a “party of killers” that indulges in “hate politics” and communal violence, he was categorical in stating that the “hate agenda” of the BJP wouldn’t be accepted in any of the southern states. Gundu Rao said that the upcoming Karnataka elections would “change the political discourse of India” by defeating BJP convincingly, while adding that the “moral victory in Gujarat” has worked in Congress’ favour. In addition, Gundu Rao said the social reformers from the south of India were in favour of inclusive social mores, and rejected any nascent Hindutva that’s practised by the BJP. While he lamented the division of Andhra Pradesh by the UPA government, he said that Congress under its new national president Rahul Gandhi would stand for politics of love, and therefore wouldn’t want a “BJP-mukt Bharat” anyway. Asaduddin Owaisi, on the other hand, said both BJP and Congress represent the same political force, and that Congress doesn’t have Muslim legislators in Karnataka. Owaisi claimed that he wasn’t allowed to hold a public rally in Bijapur, and that both the national parties are scared that he intends to take AIMIM to Karnataka Assembly polls. Owaisi however batted in favour of Telangana chief minister K Chandrashekhar Rao (KCR) of the Telangana Rashtra Samithi (TRS), saying the CM has done fabulous and inclusive development work in his state, setting up residential schools for 50,000 Muslim children, as well as Dalit children, and that’s what people want. 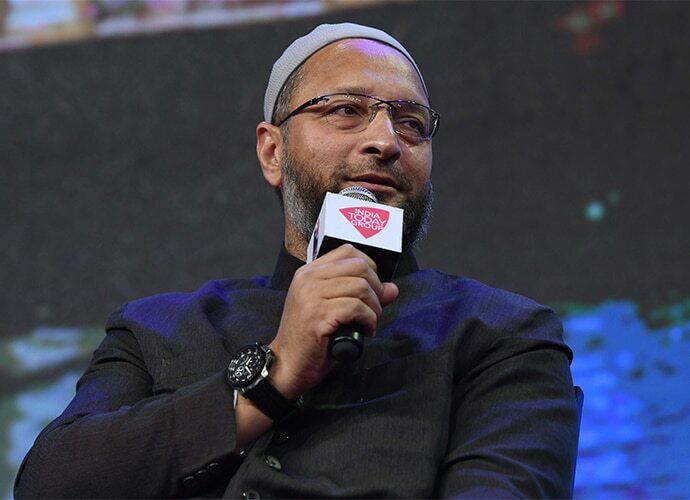 Owaisi also asserted that regional identity and parties will be crucial in the 2019 general elections, and challenged both the BJP and the Congress to contest against him in Hyderabad, even the BJP national president Amit Shah in a one-on-one contest. While he was branded a “tiger” which is also an “endangered species”, Owaisi said he had no electoral danger from anyone. He also said his favourite leaders from the South has been Jalagam Vengal Rao, former CM of Andhra Pradesh from the Congress. While BJP’s Krishna Saagar Rao said the party is definitely securing Karnataka and Meghalaya, he countered the allegations from Gundu Rao and Owaisi by saying the country is embracing BJP’s national politics, and the party rules 19 of the 29 states at present. Similarly, K Laxman echoed the point saying there have been strong leaders from the South of India, and people have entrusted their faith in the strong electoral politics of the BJP, led by a national narrative. Laxman said that BJP has rewarded leaders from the south, particularly Venkaiah Naidu and Bangaru Laxman, and claimed that BS Yeddyrappa and Ananth Kumar are “mass leaders” in their own right. While Sardesai floated the question that CM KCR had told him that the Telangana model was superior to the Gujarat model because it’s regional identity combined with development , it was supported by CPI’s Sudhakar Reddy, who said “the foolish Hindi imposition will backfire heavily” for the BJP, since history would be repeated all over again. Reddy recounted how the DMK had come to power in the wake of NDA-1’s Hindi imposition, and any insult to regional pride – whether Tamil, Telegu, Kannada, or Malayali – would be dealt with strong emotions. On his part, TRS’ Vinod Kumar said that the very existence of Telangana has been because of Congress failing to deliver equal development in the region, developing Hyderabad at the expense of swathes of Andhra Pradesh, [especially Rayalseema, Seemandhra etc]. While he acknowledged KCR as a great leader, fully in command of Telangana, he also said that the regional character of the South is predominant. Siddaramaiah, KCR, Oommen Chandy and other leaders were mentioned as well. The most ferocious of commentator on stage was undoubtedly Mani Shankar Aiyar, who revelled at being called a “secular fundamentalist”, and actually dismissing the “incremental growth” of BJP as an aberration from what he thought was “normal”. While he said he didn’t have any authority to speak on behalf of the Congress, he said he was speaking for the “syncretic civilisation” of India that would eventually reject BJP’s Hindutva politics. Aiyar said that in 2004 and 2009, it was the Congress-led alliance of the secular parties that beat the NDA.